Wine Spectator's current issue has a cover story on sushi, and inside there's a feature on sake. To tell you the truth, I haven't read it. But I know from the Colorado Wine Press blog that Spectator published sake tasting notes, with no 100-point-scale ratings. After decades of experience tasting and evaluating wines, we feel confident in our ability to use the 100-point scale in a way that's consistent, reliable and useful for readers. We have much less experience with sake, and felt that broader categories would be more appropriate to express our opinions on their quality. However, I could easily see a critic with deeper experience in sake using the 100-point scale, and perhaps if we taste extensively enough, one day we will too. I applauded Matthews' comment for its humility, something wine ratings organizations show too little of. And I still do. Having had a week to think about it, though, I wish Spectator had been its usual self and said, "This one's a 92, this one's an 87." Here's why. Most wine aficionados, in the US and elsewhere, have never had even one bottle of good sake. I like bringing artisanal Japanese sake (maybe $30-$50) to BYO events, and frequently sommeliers and wine writers tell me they never had a sake that good before. The reason is that they never spent the money before. When I wrote about sake for the San Francisco Chronicle, the most common question would be, "Where can I get a good bottle of sake for $10 or $15?" The answer is, you can't. I could name one or two sakes at the margins, but quality sake is more expensive to produce than wine and really needs to be shipped under temperature control. You can find good sakes starting at about $25, but it's slim pickings before that. Even for wine lovers, $25 is a lot to risk for a product that's completely foreign. I'm used to it now, but people who don't blink at spending $75 for wine in a restaurant have never considered spending $25 in an Asian grocery store for a bottle of sake. Why do people pursue expensive wines? Sometimes it's the reputation of the winery, which predated the advent of 100-point-scale ratings. Japan has centuries-old breweries, but that hasn't boosted the sake market here. But often, let's face it, consumers are excited by high ratings. A 95-point rating may be a random anointment by a guy with more dead tastebuds than living, but it's still a 95-point rating. It sells wine. I'm a wine lover. I don't care if any individual winery sells wine. Nor do I worry about the health of the wine industry, which is booming worldwide. So if the 100-point scale disappeared tomorrow (not gonna happen, but bear with me), I wouldn't care, and in fact as I'm more of a feature writer that would be good for me. I'm also a sake lover, and here my positions are entirely different. I worry about the health of the sake industry. Sake sales rose in Japan last year for the first time in three decades because of emotional support for the industry after the tsunami and nuclear disaster. But that's a tiny blip in a longterm trend. The quality of sake gets ever better, but breweries have been closing. The export market for quality sake is tiny, but if we drank more sake, we could help save a world heritage beverage. I also care which breweries sell sake. I want the artisanal Japanese breweries to sell sake because I know many of them are only a couple of bad years from going out of business. Did you know more than 75% of sake sold in the US is made in the US? And unfortunately, US sake is simply not as good as artisanal Japanese sake. 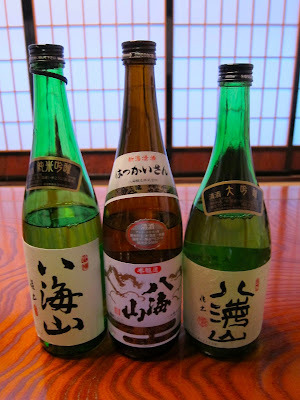 The very best sake in the US would be an adequate midrange sake in Japan. Put it this way: the very best sake in the US -- the best I've ever had, and I've tried most of them -- is maybe an 80-pointer. Whereas Japan has 95 pointers all over the place. I like putting it that way. This is why Robert Parker adopted the 100-point scale in the first place. It quickly gives you comparative information. Yes, both of these wines taste like cherries and leather, but this one is a 95 and that one's an 88. This one's better. When Americans knew little about wine, the 100-point scale was a tremendous help. Americans on the whole know nothing about sake. Heck, Matthews admitted that even Wine Spectator knows nothing about sake. I can tell people about Japanese tradition and elegance and umami and all that, but when I say this one's 93 and that one's an 80, you get it. Everyone gets it. You can quote the Big Lebowski and say, yeah, well, that's just like, your opinion man. But you get it. And moreover, people who don't give deep thought to the subjective nature of wine ratings will see it and they'll immediately understand why some sakes are worth $50 a bottle. And maybe they'll try one. Do I expect Wine Spectator to pick the best 95-point sakes? Probably not. I learned this year of the importance of umami in sake, which you can't experience by smelling. Wine critics are all aroma-dependent; it's the only way to deal with tasting so much wine. Spectator would probably do what it does with wine: go gaga over the extremely aromatic sakes, and the boozier sakes, and underrate some of the elegant, balanced ones. But that's OK. Really. Japan needs more winners, for the health of the industry. And the field of unrecognized great Japanese sakes is currently so large that Spectator couldn't help but find dozens. In the 1980s, the 100-point scale was a great thing for wine. It punished wineries for bad hygiene and rewarded wineries for taking production seriously. Anybody nostalgic for wines made before the 100-point scale is denying the reality of what the vast majority of wine tasted like then. The 100-point scale made lazy wineries shape up. More to the point I'm making, the 100-point scale also excited Americans to buy more wine and pay more for it. The quality of Japanese sake is already there; the industry doesn't need the constructive criticism of a point scale. But US drinkers are timid and parsimonious when it comes to sake, and they need something to excite them. If that something is a 98-point rating, I'm all for it. That 75% of sake sold in America is made in America upsets me. I've noticed the ratio in Pennsylvania stores does seem to be about 3:1, but I hadn't realized this was a national trend. Having recently returned from my first trip to Japan, I've found that the US sake I used to enjoy just doesn't seem to cut it anymore. I'm now inclined to agree that the best American sake (though I doubt I've tasted as much of it as you have) can't measure up to the real stuff (of which I've also surely tasted less than you have). 100-point ratings won't save the sake industry by themselves, but they're certainly a lot more likely to help it than hurt it. I think you're onto something, and I hope others more influential than I am feel the same way. Could this be the birth of the Sake Advocate? It's time to Democartize sake! Sorry, little bit of the North Carolina hillbillie coming out - that's democratize. Blake: Could you list Sake's you consider to be great someone could walk into K&L or Beltramos (or BevMo) and buy? @winterspeak - Why not but at True Sake on Hayes St in SF? I'm of two minds here. While I would love to see better times for domestic sake production, I fear that WS-driven sales to foreign markets would further change the focus of sake production from what it has traditionally been to the currently trendy ginjo-daiginjo/fruity, aromatic styles that have little anchor to Japanese food culture. Staying alive is important. But if, in the process, the industry loses sight of it was, then is it really staying alive? Or is it simply turning itself into an industry that produces sake for those who prefer wine? Anyway, I enjoyed the article (and the one on SO2 @ Chandon, as well). The editors at WS probably did themselves at least a small favor with regard to their image in Japan. The Wine Advocate took a serious credibility hit here when it came out with an article rating sakes... in a country where sake scholarship requires years of rigorous training, such a cavalier approach is bad form. Confidential to the woman who tried to use "egobait linkbuilding" to push her client in the comments: Go egobait elsewhere. And please, let the door hit you hard on the way out. Winterspeak: Jack's right, if you live in the Bay Area you should walk into True Sake and get a recommendation. To tell you the truth, I just ran through K&L's list online and the ones I know I like are pricey: Nanbu Bijin Junmai Daiginjo ($70), Ginga Shizuku Junmai Daiginjo ($65), Chokaisan Junmai Daiginjo ($50). Take your chances at True Sake. Winterspeak: Beltramos has Dassai 23. You want to start at the top, with a great sake? Try that one. But it's $80. It's significantly better than Dassai 50, which is $28. You get what you pay for here; "23" is the polishing ratio.